It’s funny how memory works. It claims its own geography, creating a map that is sometimes different from what we think we might remember. Sometimes it’s the everyday paths, rather than the extraordinary, that stick: the streets you walked down on the way to school, the chip shop where you lingered in the evenings and the shoe menders next door. ‘That’s what I remember anyway’, says Fiona White, who was born in 1969 and lived in Covent Garden until she was thirty. 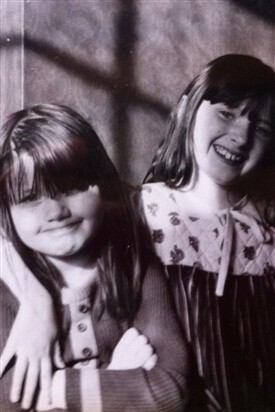 Fiona is pictured as a little girl in the photograph to the right with her sister Natasha: 'I'm the one with the long fringe and arms folded,' she says. 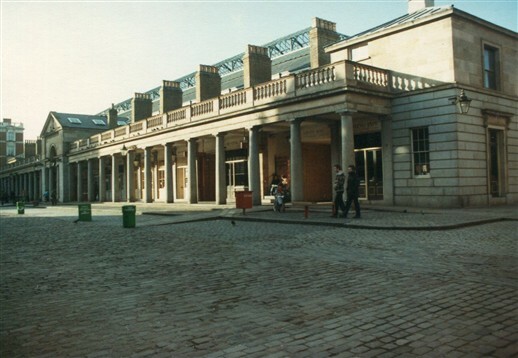 In the 1970’s, Covent Garden wasn’t the hectic place it is today. Fiona remembers a sense of quietness, the stillness in the streets around the Piazza and the old market area, which were almost deserted of pedestrian traffic, particularly after the market closed. Now she lives in southeast London with her husband and two children. But in the 1970’s, Long Acre, where she lived with her parents, and then Mercer Street, where she moved as an adult, were more residential, Fiona recalls. However, there are still a few times these days when she can recapture the feeling of what Long Acre was like when she was a child: ‘it’s a lovely area to walk down on Christmas Eve when it’s quiet and everyone has gone home and then it gives you more of an idea of what it was like’. Walking the same streets every day, Fiona had that specific child’s sense of ownership of her community. This was her Covent Garden, and she always walked: ‘I think I was about ten when I started taking myself to school round the corner to St Joseph’s so I’ve always felt very safe here’. 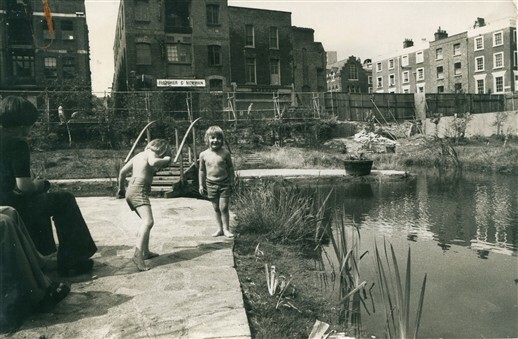 Fiona played in the community garden on the corner of Long Acre with her friends from St Joseph’s and remembers stepping on the frozen shallow pond in the garden and falling in. Years later, she laughs at how mortifying that was as a ten year old. When she went to secondary school in Euston, she continued to walk, and used her bus money to buy sweets. As she got older she remembers the convenience of how close all the shops were, and the particular kinds of shops that used to line Long Acre. She remembers that there were more crafty shops back then, and she especially liked the Inside Out shop on the corner of Long Acre where she went with her mother. As Fiona became more independent her mother would send her on her own to the Civil Service Store on the Strand to pick up ‘bits and pieces.’ Fiona recalls that at the time it was one of the only department stores ‘where you could buy a variety of things, including food’. The Civil Service Store burnt down in the eighties and Fiona and I chuckle about how suspicious that seemed. 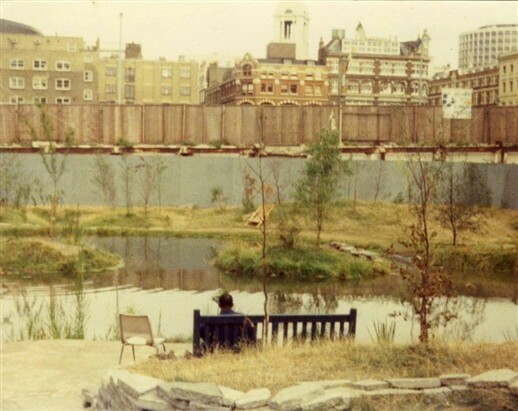 When I ask what she remembers about the Covent Garden political situation in the 1970’s, I feel silly, as I remember Fiona would only have been a very small child during the campaign to save Covent Garden from redevelopment. Although her father, Noel Tobin, played an active role in the campaign, she remarks, ‘Mine was more of a personal kind of view of the area’. Fiona’s words make me think of the famous phrase from the late 1960’s and 1970s, ‘the personal is political’. Although Fiona was a child at the time, I think the phrase might have captured the spirit of the Covent Garden activists, because a lot of the campaign to save Covent Garden from redevelopment in the 1970’s was about trying to bring the personal voice, the perspective and input of the residents of Covent Garden to the political, the Greater London Council. Parents like Noel fought for the right of their children, like Fiona, to continue living in the place where they were growing up and going to school. So that Fiona is able to say she has a personal memory of the area is the success of the vision of the idea of the ‘personal is political’. But there are some moments that do stick out in Fiona’s memory about the more colourful aspects of Covent Garden. Because her parents both worked for theatrical venues, Wyndham’s Theatre and the Royal Opera House, Fiona remembers a bohemian crowd and lots of parties in the Covent Garden area. Her parents were friends with people that invited over to their homes the comedian Tommy Cooper, and once Fiona recalls coming down a staircase at a friend’s house, and at the bottom of the stairs was the famous English ballet dancer Margot Fonteyn who danced at the Royal Opera House. When I ask if she introduced herself, Fiona laughs and says she was too shy, but remembers vividly that her friend went down the stairs first and ‘she said hello to her, and I remember thinking, oh, she said hello to her first’. All the while we’ve been speaking, Fiona’s children have been sitting quietly at the table with us, sometimes listening, sometimes getting up to look out the window onto Seven Dials. But it seems important that they have come to hear their mother’s story, to sit alongside her as she tells it. Fiona’s children say they love the new Covent Garden, with its vibrancy and excitement, shops and performers. Although the old Covent Garden may be accessible only though memories and photographs, the new Covent Garden still has something to offer to them. They walk around the city to claim it as their own and share in Fiona’s memories of her childhood.